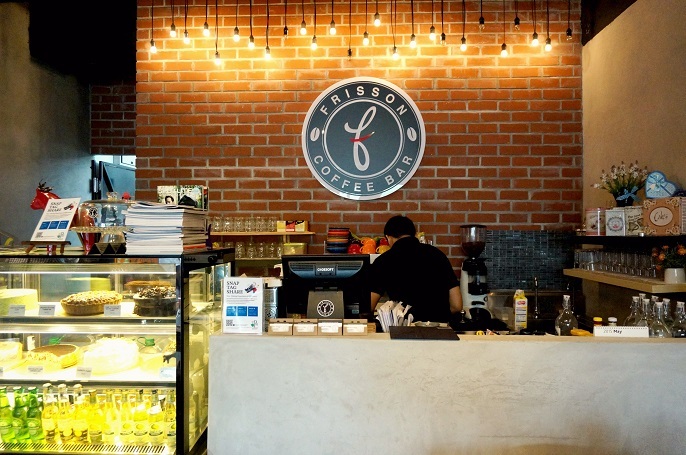 Frisson Coffee Bar is a great place where you can stop at anytime of the day. 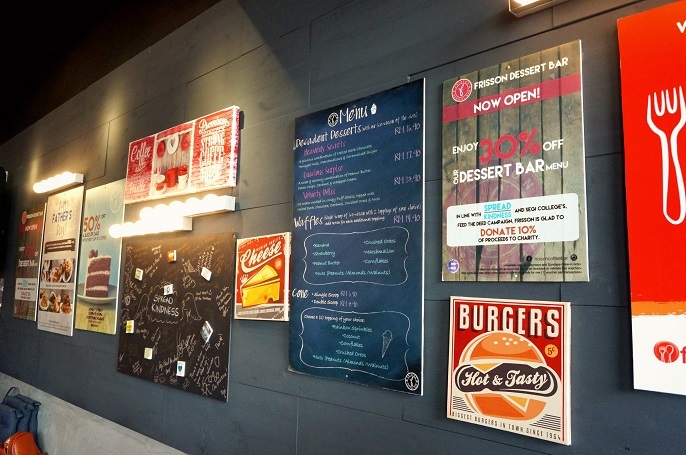 They offer wide range of breakfast, lunch and dinner for your selection, which I am sure you can satisfy your cravings happily with any of the delicious choices you make. 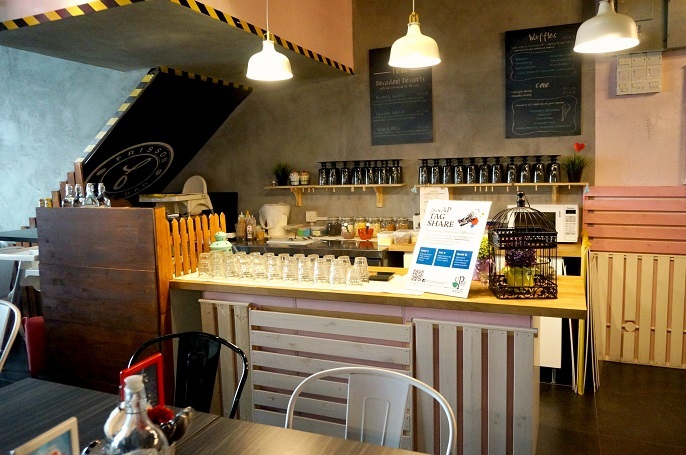 This little black building located at Damansara Uptown PJ, the busy downtown which full of various types of cafes and restaurants. 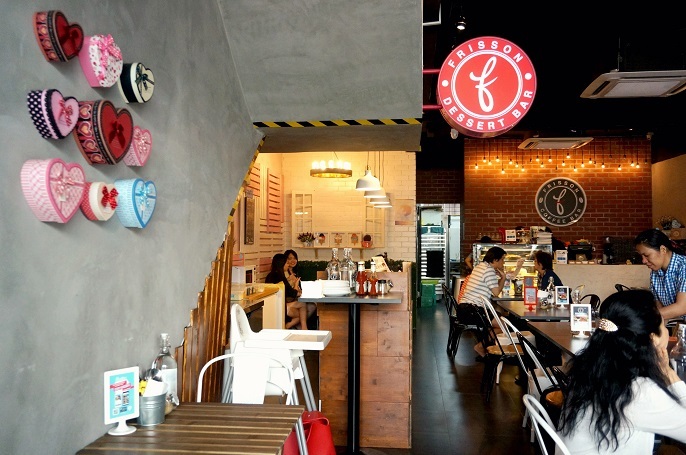 If you google Frisson, you will see it has listed under top 10 brunch cafes at Klang Valley. Pretty adore with it's vintage styling look. You are always welcome to check their menu on the little bar table before you decide to dine in the cafe. 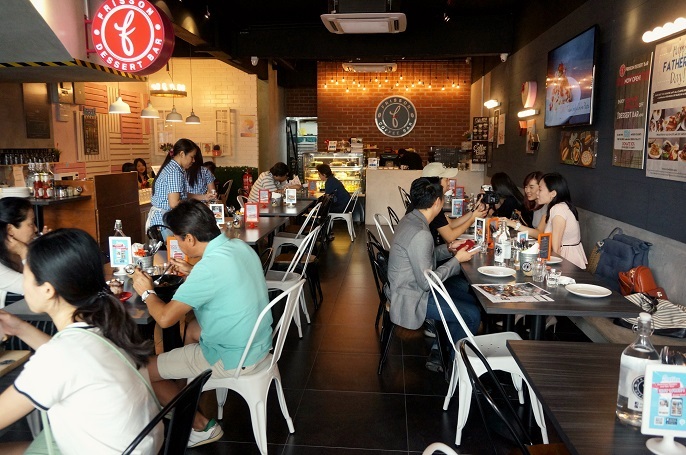 Frisson has a satisfying customer service whereby the waiters and waitresses will greet you with smile and they are all friendly which will make you feel welcomed once you stepped your foot into Frisson. The cafe has a beautiful ambiance with the cement mixture for brick wall. On the right side, there is a long bench which made with concrete with pillows and cushions provided so that you can sit more comfortably. 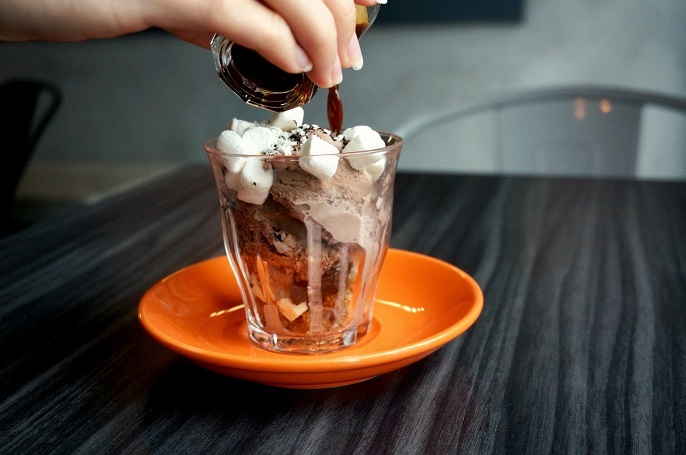 Frisson not only serving meals, they also have a mini dessert bar which designed with wooden desks and shelves at the left corner for serving variety of ice-cream inspired desserts. It is a busy café. Customers are non-stop in and out when I was there about 3 hours plus. 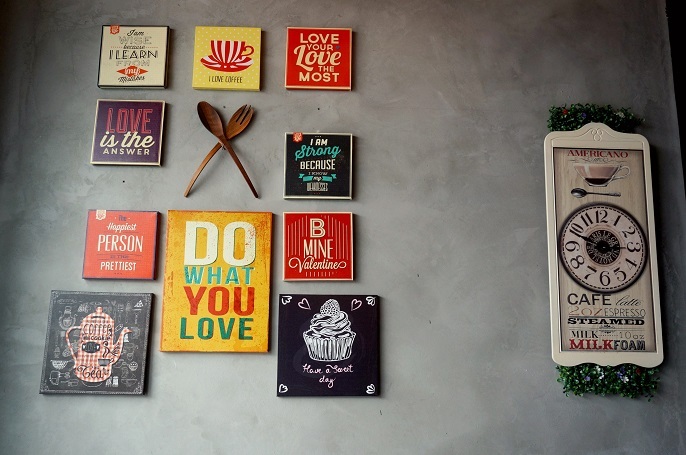 The charcoal grey wall looks great in the dining room, which attracted me the most. It appear to be like a poster gallery with the colourful poetic posters line and also current promotion posters. All the mixture colours stand out against the wall very well. 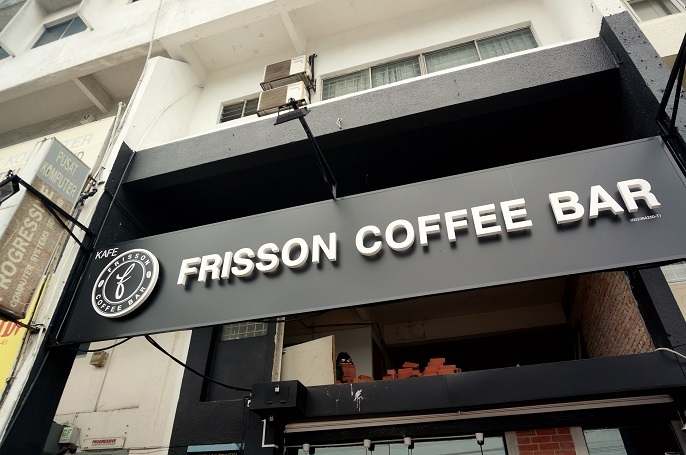 Let’s start the Frisson menu with their breakfast choices! Croissant Ala Fusion Chicken @ RM 22.90. 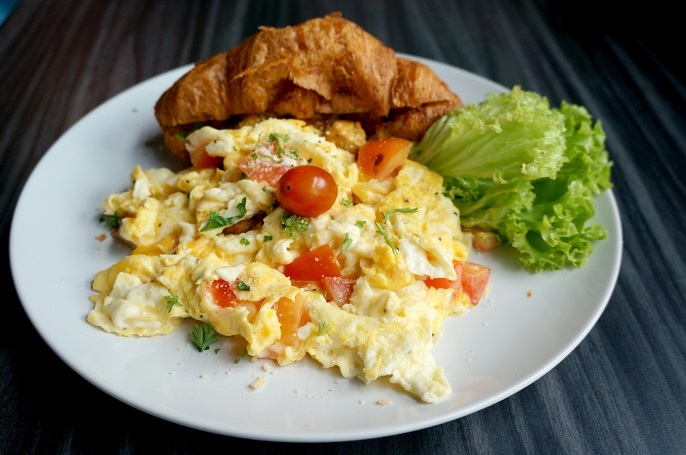 It is kind of a special dish; the croissant stuffed with 5 pieces of curry chicken breast, and also scrambled egg wrap with tomatoes as it's side dishes. 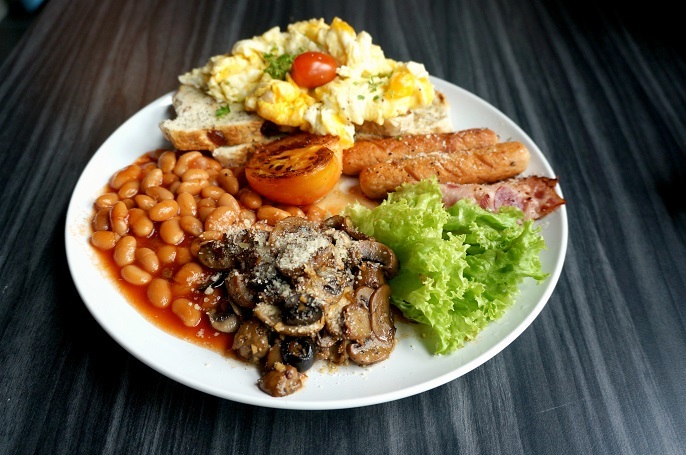 Everyone’s love big breakfast, especially during the lazy weekend brunch! Frisson has its own big breakkie set @ RM28.90. It is a super big portion which includes main course recipe of grilled tomatoes, mushroom, baked beans, and chicken sausage. In addition, you can also have a choice of beef bacon or chicken ham, and a choice of sunny-side up or scrambled or omelet. Too much choices huh! All the Frisson skinny pizzas are in 8-inch, pretty small and I can almost eat all by myself. The pizzas are all made with 2 layers crusts which I was quite impressed with. Plus, the crust is so thin and crispy till I couldn't stop one piece to another piece. Their in-house sauces for the pizzas infused with 19 ingredients and they use parmesan and mozzarella cheese for the topping. 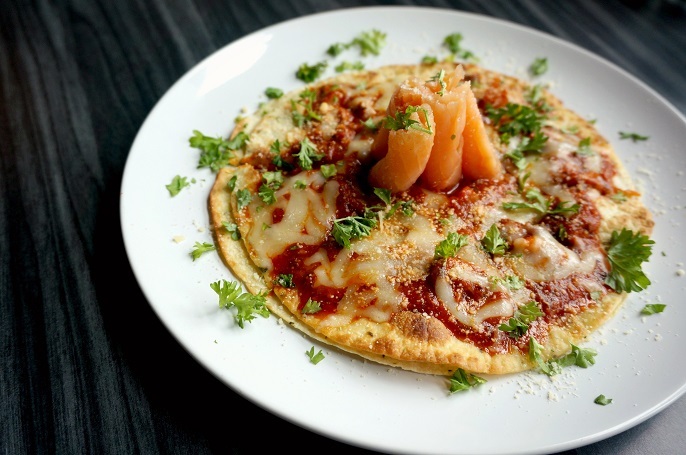 Norwegian Smoked Salmon Pizza @ RM18.90 with smoked salmon is one of my favourite as I just love the smokyness and I think it really goes well with the crispy thin crusts. 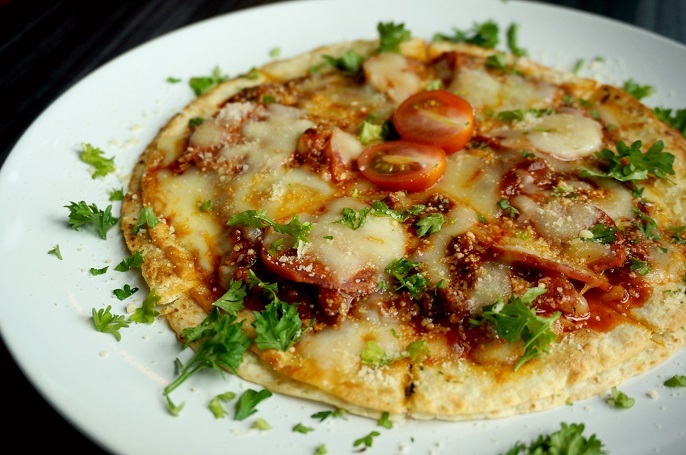 Enjoy this Beef Pepperoni Pizza @ RM15.90, topped with beef pepperoni and cheeses if you are a beef lover. If you are vegetarian, you can go for their Vegetarian Pizza @ RM15.90, which only has tomotoes and cheeses. No worries! Frisson menu has all kinds of pasta! 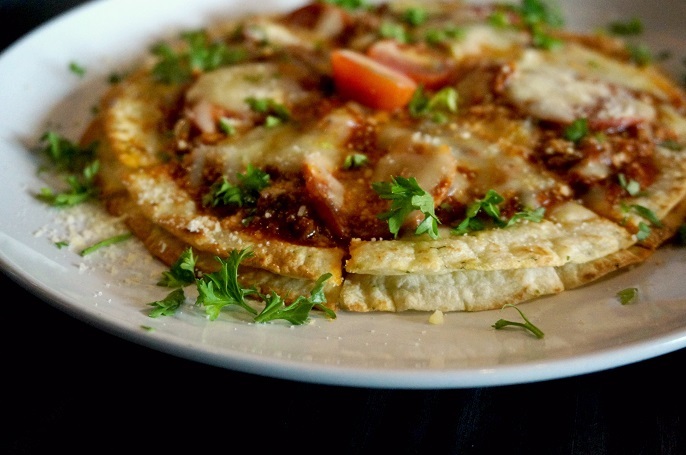 All their pizzas are made with their homemade sauce which infused with various ingredients. 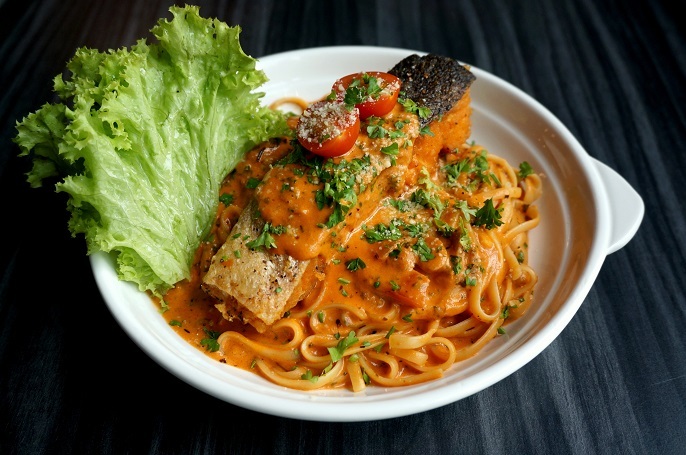 Creamy Salmon @ RM28.90, is a creamy pasta; made with their unique homemade creamy tomato sauce and topped with a big piece of pan-seared salmon. 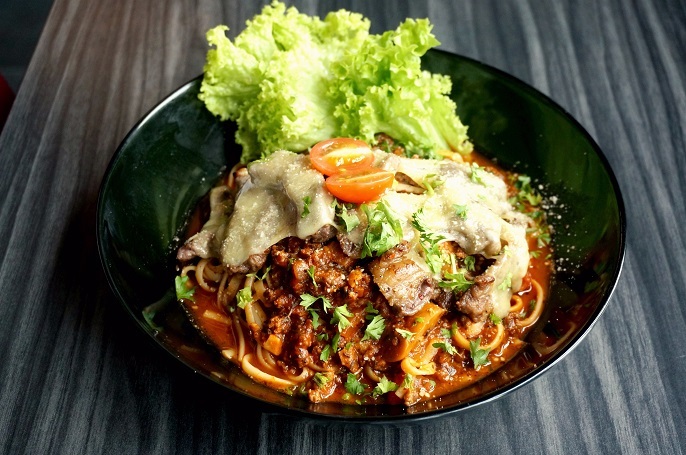 Beef Parmigiana @ RM26.90, looks a bit like the Taiwanese Beef Noodle Soup for me. The moist and juicy beef striploin that covers with a piece of cheese blend very well with their own herb sauces. Picante Soft-Shelf Crab with cream tomato @ RM 29.90. This dish for sure will fire up your taste buds! 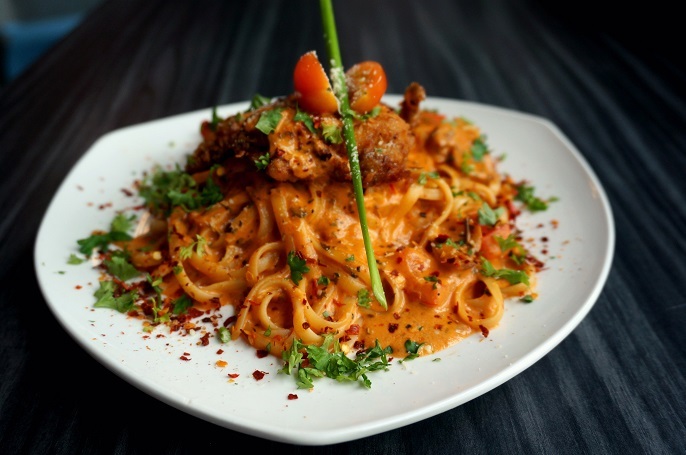 It is a spicy deep fried soft-shelf crab with chili padi, red peppers, paprika and chili flakes served with spicy rosemary creamy tomato sauce. So, if you are a spicy lover, you will definitely enjoy this pasta very much! But if you cannot take too spicy and would like to try this out, you can notify the kitchen to put less spicy upon your ordering. 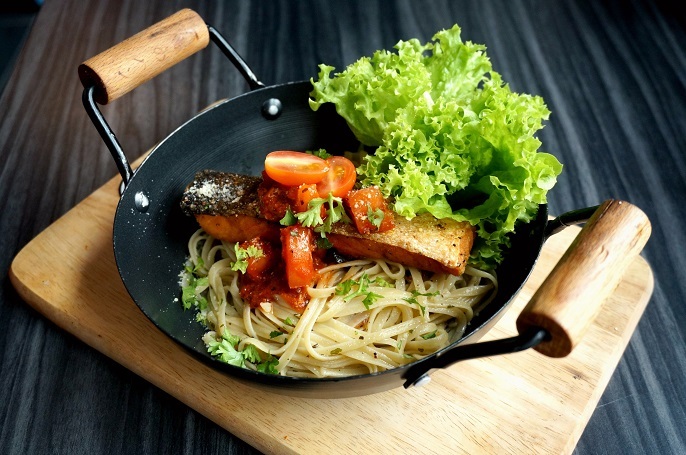 Garlic Basil Salmon @ RM28.90, served with basil and parsley, topped with pan-seared salmon filled and marinated tomatoes. This is a light pasta among the others as it cooks with just olive oil, and the salmon also doesn’t cook with any strong taste sauces. Wrap up your meal with Frission dessert! Frisson is not only prepare the food with their homemade sauces, they also bake their own cakes! 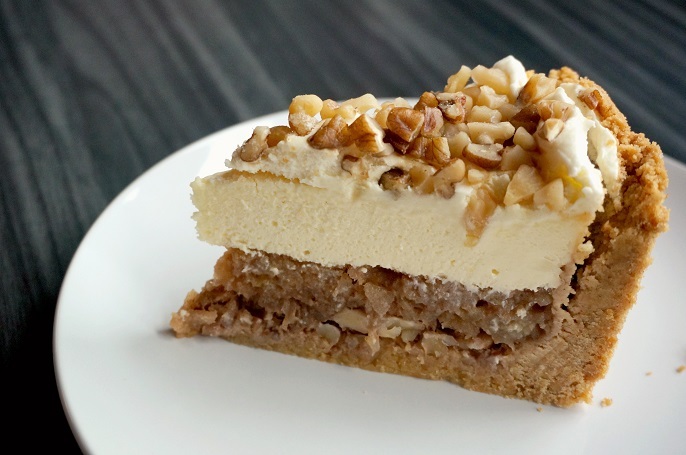 This Salted Caramel Apple Cheesecake @ RM15 has very rich cheese filling with layers of salted caramel and apple bites. 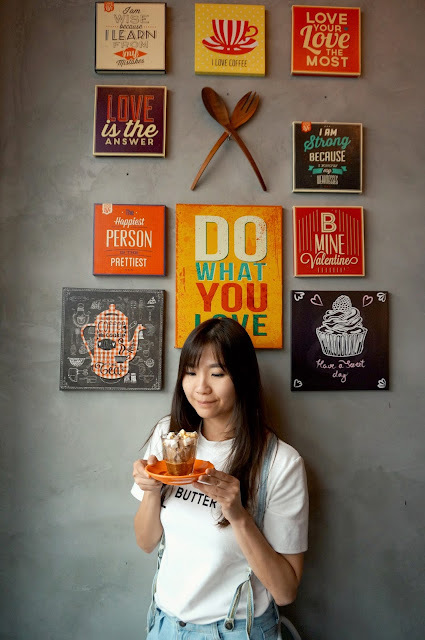 If you love sweet food, this is one of the must try you can consider; however, if you don't like over-sweet food like me, this probably wouldn't be your first choice. 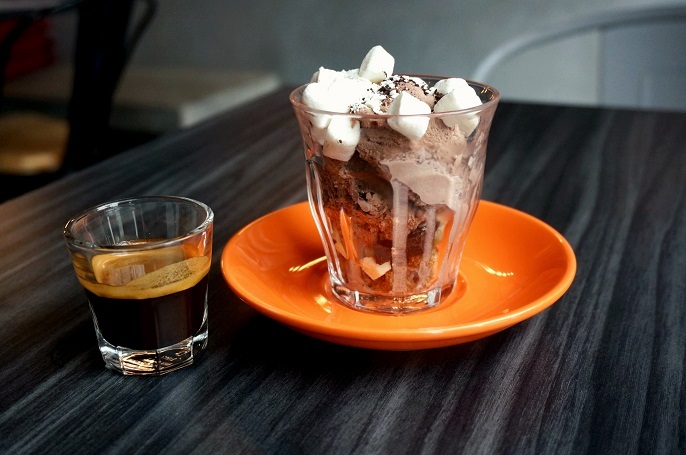 Other than having cake as your dessert, Frisson Affogato is highly recommended for you. 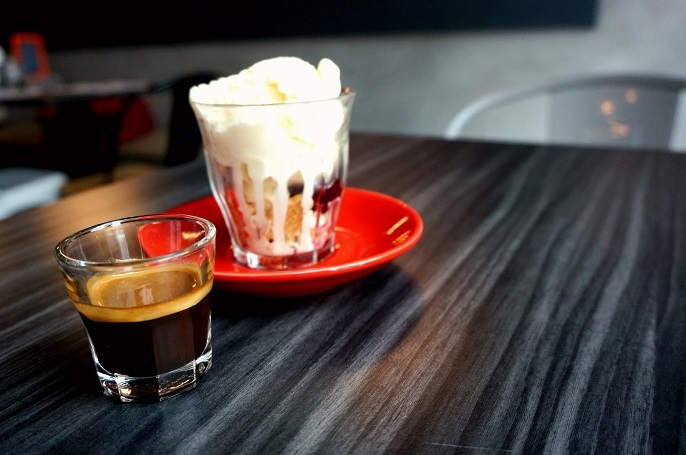 All comes with single shot espresso and a scoop of premium ice-cream from Australia. The prices are from RM10 to RM23.50 depending on what flavour you are ordering. Black Forest is the most highly recommended by Frisson. All food served at Frisson have a unique taste all it's own, because they made their own sauces for their food preparation. Prices are a bit expensive, but completely worth the money in terms of the food quality, and ingredients that they made use of. If you are looking a somesort different cafe/restaurant which served distinct food, then I would say it is certainly worth of your trying. 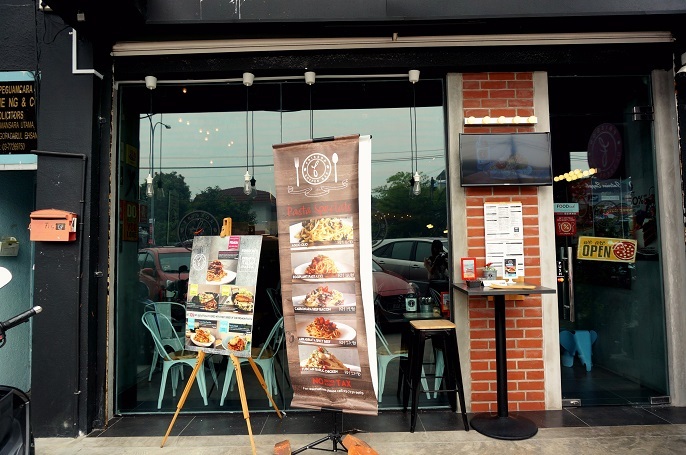 Frisson pizzas, soft-shelf crab pasta, croissant ala fusion chicken and affogato series are my most favourite.